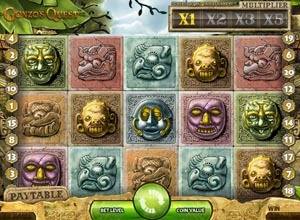 Gonzo's Quest Slots - Hunt Hidden Treasure & Win Cash! Step 2 – Select your coin value from 0.01 to 0.50. Step 3 – Click the round green button in the center to start the avalanche reels and play the Gonzo's Quest game. Join Gonzo the Spanish explorer as he searches for the mythical city of gold. This game has 20 fixed pay lines and 5 reels, although the reels don't spin, they “”avalanche””. A winning combination sees the relevant symbols disappear and new ones fall into the open spots, giving you more opportunities to win the big jackpot. There are no free spins but there are free falls! Three or more of the free fall symbols anywhere on a bet line will activate 10 freebies with higher multipliers. The more avalanche wins you get, the higher the multipliers – 15X being the maximum! The jungle-themed Gonzo's Quest has a lot of excitement to offer with its cool 3D animation and graphics. Go find your very own treasure in the jungle. You will find all of our games on the game reviews page.